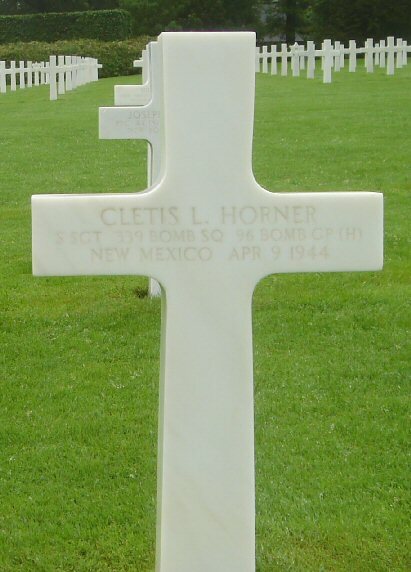 Sgt (Ball Turret Gunner) Cletis L. Horner and other American airmen buried in Svinø Churchyard were disinterred in 1948 to be tranferred to the USA. However, he is buried in Luxembourg American Cemetery, Plot D Row 3 Grave 5. Entered the Service from: New Mexico. Awards: Air Medal, Purple Heart. (Source: ABMC) See Monument to 46 American airmen and the map USAAF with all American airmen buried in Denmark.